Take three large microfiber cloths and lay them on top of each other, at varying angles. 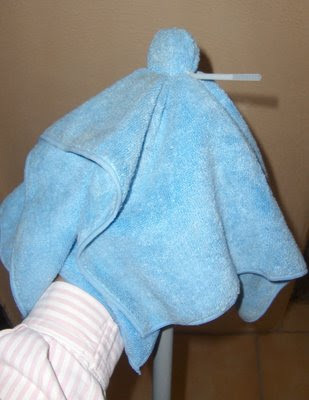 Center your stack of cloths over the end of an old broom/mop stick, and then, a couple of inches from the end of stick, strap them on with a tightly-pulled, heavy-duty plastic cinch (available at Sam’s and office-supply stores). (UPDATE, 2016: I now use these wide rubber bands instead of cinches–they are durable and reusable.) Invert this assembly and run it around your floor, under furniture, or over your car. 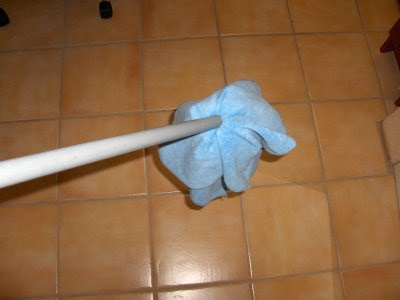 Clean the mop by shaking it outdoors. You could even use a lint-brush on it. When it gets too dirty to be useful, the cinch can be cut off and the cloths released for machine-washing. Repeat construction process after they are dry, using a fresh cinch (I use multipurpose ties/cinchos by Thomas Betts).